How do we thrive when our lives and our loved ones are in danger? How do we flourish and emerge into stronger, more grounded selves? After displacement, we seek spaces and communities to call home – to hold and uplift our stories. Our forests may burn down, but our soil is only left more fertile. Our roots will grow again, resilient and brave; we invite you to grow with us. Why wait for a seat at the table when you can have your own? 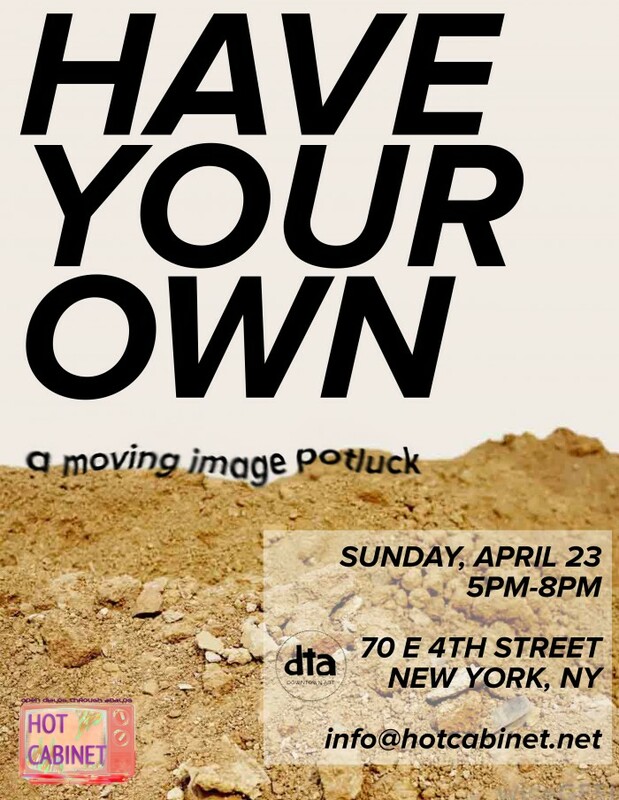 Have Your Own is a moving image potluck centering works by queer, trans, and gender non-conforming creators of color. This is not a curated event, but rather a space for you to bring yourself and bring your roots. Bring a 3-5 minute moving image piece (interpret this however you like), or a dish to share with guests. To submit your work ahead of time, email info@hotcabinet.net with one short sentence to describe your piece as well as a video download file or Vimeo/Youtube link. Otherwise, bring your work on a USB to the space with you. • This event takes place at Downtown Art (about 5 blocks from the F train at 2nd Ave, or 7 blocks from the B/D/F/M/6 at Broadway-Lafayette) in a theatre space the second floor of a four floor building. The theatre is accessible by elevator or one flight of stairs. • There are two single toilet restrooms, both are wheelchair accessible. • The theatre seats about 75 with folding armless chairs on risers as well as chairs on the floor. Front seats will be reserved for community members who cannot climb stairs. • We will be projecting moving images on a large screen, we will have subtitles as made available by the artists. • As this is a potluck, there may be food alergens present in the space, including but not limited to gluten, dairy, and nuts. Many thanks to Ryan Gilliam and Downtown Art for hosting this incredible event, and to YOU for sharing yourselves.